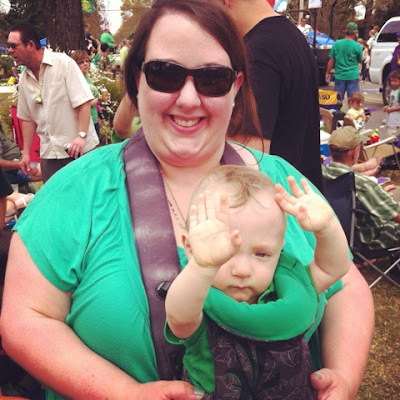 This past weekend was St. Patrick's Day and in typical NOLA fashion we had multiple parades. It's hard to say living in New Orleans but I'm not that into parades like I used to be. However, my husband Clint and Noah just love it. 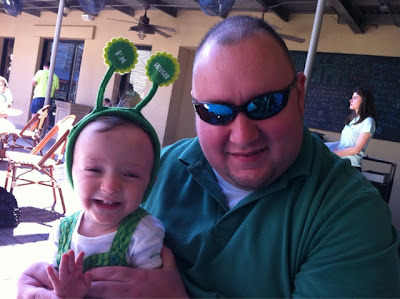 We celebrated and wore green all weekend and had a blast (for the most part) while doing it. On Saturday we went to the Irish Channel Parade and our krewe camped out on Magazine Street. We tried out the new restaurant La Fin Du Monde, which is in the location where Cafe Rani was for years. We have mixed reviews between our party of 15. I personally loved my shrimp and grits but our crew overall wasn't impressed and I don't think we will be returning. Boo. The parade took FOREVER to get there and thankfully we were able to enjoy some CC's Coffee and Sucre' ice cream while we waited. The kids went a bit stir crazy waiting but once the parade got to us they had a blast. Noah and his cousins had a lot of fun trying to catch cabbages. The most treasured catch? A mini box of Lucky Charms, Noah was so excited about it. On Sunday we headed to the St. Patrick's Day Parade on Metairie Road. This is one of my favorite parades and Clint and I actually rode in this parade before we had kiddos and had a blast! Our friend invited us to a party with her family and we had a really fun time. They had some yummy "Leprechaun Lemonade" that Noah enjoyed and she has a daughter the same age as Liam so they were able to hang out in their strollers together and enjoy some cheerios while we caught the parade. There is another parade this coming weekend but this mom has had enough of parades for 2013! 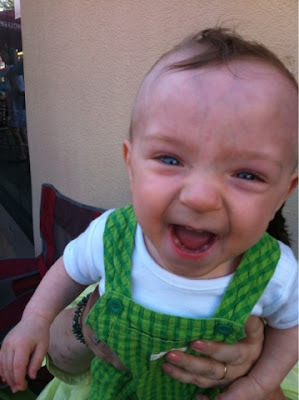 Liam and Clint were decked out in green, how cute is Liam here? At only 17 months, Liam knows how to throw his hands up at the parade! 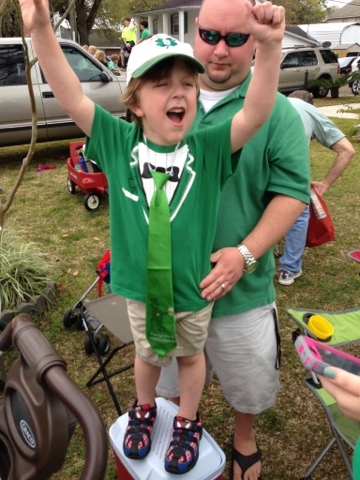 Can't pinch this little guy, he is decked out in his green!